All RVs and campers MUST use the BOURNE GATE to access the MMR. The Bourne Gate is located near the city of Bourne, MA off of Hwy 28. After coming over the Bourne Bridge you will enter into a "Rotary" (circle). Take this rotary straight through and follow Hwy 28 South. At the second rotary, follow it around 3/4 of the way so that you end up going to your left. Look for signs that say Massachusetts Military Reservation or Memorial Cemetery. The gate is about 1 mile down the road. Once through the Bourne Base Gate, proceed forward and take the first right on to West Hospital Street. Bear left at the first split in the road. At the stop sign, continue straight (Base Gas Station and Exchange will be to your left for future reference). Take the next right onto Ent Street. 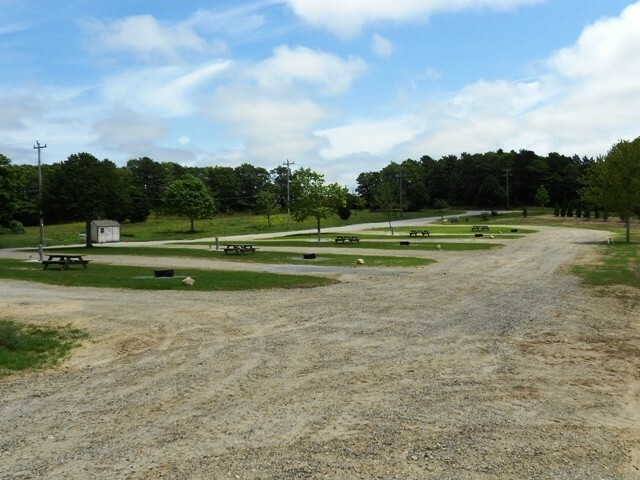 Enter the parking lot on your immediate left (MWR Admin and Child Development Center) and temporarily park RV/Trailer at the bottom of the lot. The Wings Inn Building (#5204) will be to the right of the parking lot. (2 story building with white and brown facade). Proceed to the Wings Inn front desk to check in (blue awning). They will provide you with directions to the RV Sites once check in is completed. Reservations can be made 90 days before the start of the reservation. Reservations are required and can be made by contacting the Wings Inn at 508-968-6461. Credit card information is required to confirm and hold reservations. Cancellations must be made 14 days before arrival as not to incur a cancellation fee. Late cancellations or no-shows will be charged for a nights stay. No shows may lose privledges to make future reservations. Strong AT&T and Verizon 4G in the campground. 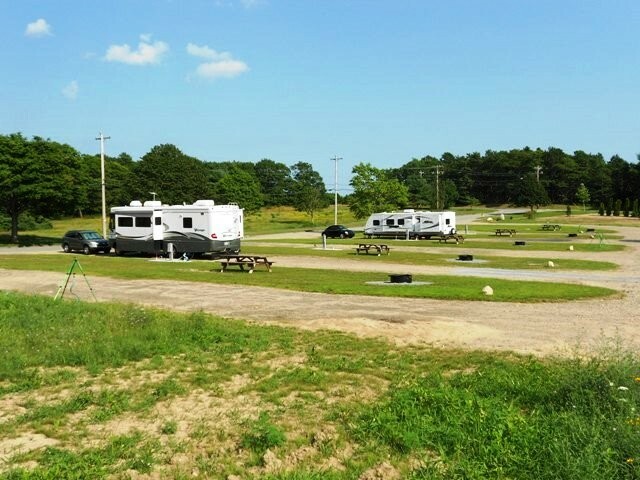 Free Internet is available at the Wings Inn, located approximately 1 mile away from the RV sites. Pets are allowed at the sites but must be kept on a leash at all times. Owners must clean up after their pet and must ensure their pet(s) have current vaccinations. Pets cannot be left alone at the site. Do not leave your pet outside unattended, especially at night. RV or hard shell campers only; No popup campers or tents allowed at this time. 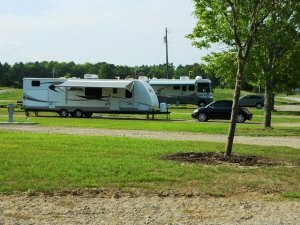 RVs are allowed to park 1 additional vehicle on their site. The maximum length of stay at one time is 14 days with a maximum stay of 28 days in a calendar year. After the initial 14 day stay is completed, patrons can continue on a space available basis if the site is not reserved. This second period can last up to 14 additional days (28 days total). 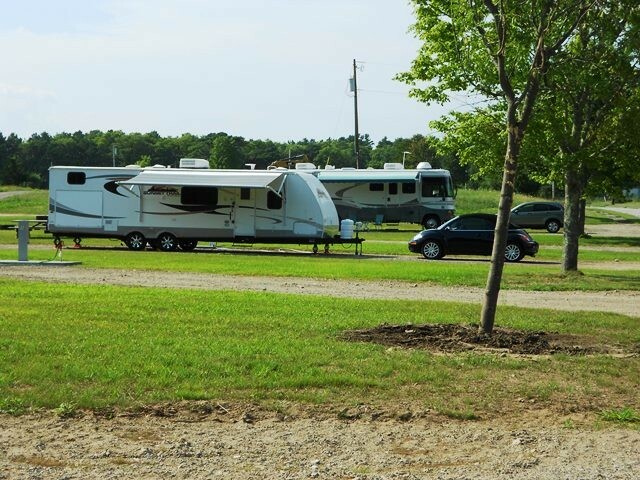 This new RV Park opened on July 2013. Great location to explore the Cape Cod area from. This is a small campground with only five sites and I am rating it based on being a small facility. The staff that oversees the campground are great and will readily help you any way they can. It has full hook-ups that worked well. Used antenna and satellite dish for watching TV. Easy to lock-on to satellites. The site I had was level both left to right and front to rear. There is no bathhouse, etc. at the campground but I knew this in advance. The laundry facility is in the billeting office and is free to use. All machines were new and worked great. There is internet in the laundry facility to use while waiting if you so desire. The exchange is small but had a lot of stuff including clothes, electronics, food, etc. There is no commissary. We had a pizza from the bowling ally/club and enjoyed it. Will definitely stay there again if in the area and luck out getting a reservation. My reservation was apparently not logged when I called, and the FOD had trouble contacting anyone to get confirmation. I was finally escorted through winding streets of military housing to get to the campground which had only six sites, and all were taken. I was able to back up to another camper and use the 20 amp plug off his post. No restrooms or facilities of any kind, no shade, no internet. Just out in a field. 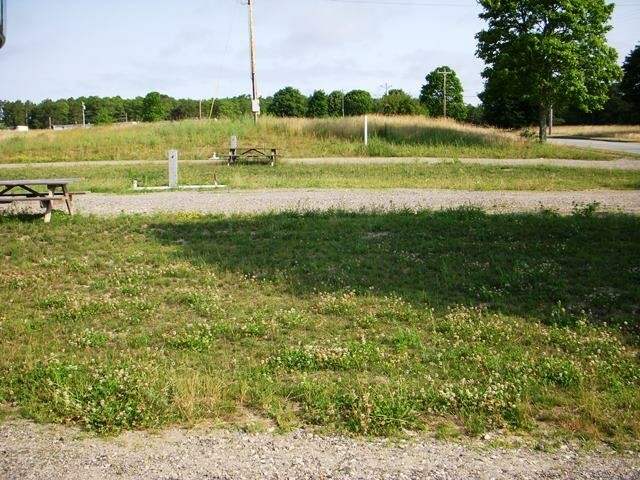 Pictures say allot, you get what you see... an open area full hook-up... no showers or toilets... "very quiet". Nice place perfect for us because we want to see Cape Cod and not hang around the camp grounds. Nice little PX & Commissary, Theater (that is not always open), Gym on the Army side (hrs. are very limited) and a nice little Cardio fitness "hut" located on the Coast Guard side (by landing strip). Washed are clothes for free at the Wings Inn Building 5204 (2 washers & 2 driers). Gas station does not have diesel but does have Blue Rhino propane. Follow directs above when arriving not your Navi!... if not you will end up in housing area "OFF LIMITS" to all that do not live there! Our Verizon connection was "OK" 1-2 bars in the camper,, we had to turn our booster on in order to "maintain" a good connection sometimes. If you come with children better bring something for them to do. We were here to re-explore Cape Cod as we had been here many years ago. This location is Great for touring this area as it is approximately a one hour drive to Hyannis, Wood Hole and Plymonth. Hyannis is a good place to take a day ferry to tour Martha's Vineyard or Nantucket. Also about two hour drive to Provincetown. Although the sites are basic W/E/S no wyfi or cable it is a great value as other campgrounds with more amenities in the area are $50-$100. Grass is cut weekly but its been a long time since weeds around the utilities have been trimmed. Hopefully this will improve with the new MWR manager and new base CO. There also are plans for the future to increase the number of sites. We stayed here for four nights after leaving Boston and wanting to explore Cape Cod. Overall we would say the experience was average. The directions to the park were dead on, so follow them exactly. Check in was an easy process and getting to the site was as well. The site was huge! We could have easily fit another unit behind us with room to spare. We didn't need to use any leveling blocks and hookups were ideal for our fifth wheel, although the sewer was not quite level and I needed to walk the hose to drain it. There is no cable or wifi, but we picked up all the local channels needed over our antenna and Verizon hotspot had solid coverage. The mini mart is very limited in what it carries and the closest Walmart, which is also recommended by the campground, is not a Super Walmart and does not have everything you're looking for. We went to the Inn to use the free laundry, but there is only one washer and one dryer and the couple that was using it when we arrived said they had been there almost an hour and the washer still hadn't finished, so we didn't bother returning. If you love Cape Cod and don't mind a nearly two hour drive to Provincetown, if that's where you're headed, then this park is for you. Compared to everything else in Cape Cod it is a deal, but we did not care for what it had to offer and have no intention of returning to Cape Cod. We can find beaches anywhere. We were told by the manager they plan on expanding the number of sites, but that seems quite a ways down the road. Pictures do not do reflect current condition. The green grass is gone and weeds are abundant which was in need of cutting. The base dining is on the other side of the air field but has decent food at extremely low price. I had breakfast there and was 1 of three patrons. The drive to any off base dining is quite a trip, not exactly around the corner. The exchange and mini-mart personnel are extremely nice and even delayed closing while I shopped for a few items. Overall, the RV site is pitiful but considering the price and being on Cape Cod then can't gripe to much. We would have stayed longer but Hurricane Arthur changed our plans early. We will return. This is a campground whose location can't be beat for the money. However, there are only 5 sites for use. Campground sites are level gravel with full hookup. 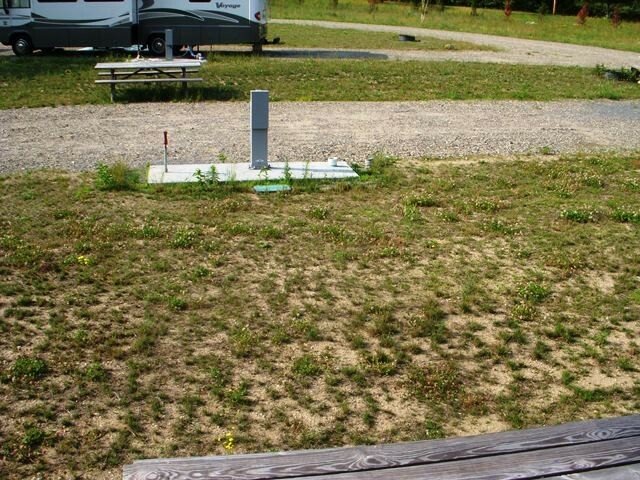 Unfortunately this campground and the entire base are not maintained as you expect. Whoever mows the grass does not move anything and simply mows around it!! The grass around and under our picnic table was higher than the seat. The same problem existed around our utility hookup area. The staff in the office was friendly and helpful. Ice and laundry are free. WiFi is only available where you check in. We would stay again if in Cape Cod, but hope they give more attention to campground maintenance. Wow, what a gem! We have traveled to the Cape for several years and were thrilled to learn of this new park. 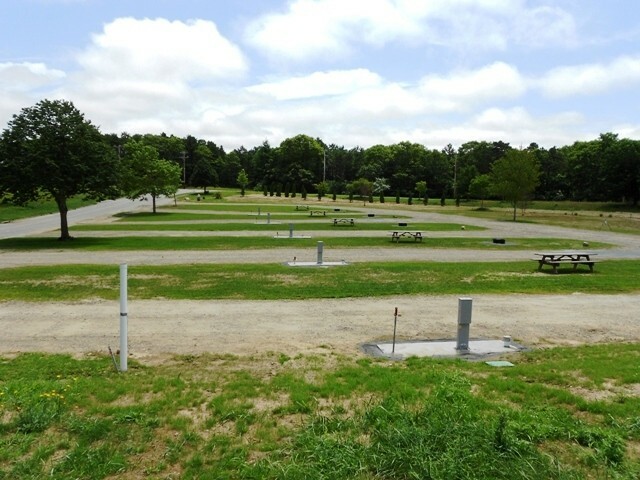 RV parks on the Cape are very expensive and rarely have sewer, so $25 is a real bargain. All 5 spaces are pull-thrus and very large. The area is peaceful and quiet with plenty of wild turkeys and an occasional fox. Gas station and BX/commissary are close by. FREE theatre and FREE clean washers and dryers are also available. Strong WiFi is available at the Wings Inn (where you check in). We loved it here and would definitely stay again. I agree with the previous comment. I would request adding to the directions, "The Bourne Gate is located near the city of Bourne, MA off of Hwy 28. After coming over the Bourne Bridge you will enter into a "Rotary" (circle). Take this rotary straight through and follow Hwy 28 South. At the second rotary, follow it around 3/4 of the way so that you end up going to your left. Look for signs that say Massachusetts Military Reservation or Memorial Cemetery. The gate is about 1 mile down the road. It is a very nice place. Although there are no amenities at the camp site, there are things to do on the base. The Coast Guard "Galley" is open to all. No ID was required. The cost was about $2.65 for Breakfast and $4.65 for Lunch and Dinner. Open 7 days a week. It is located by the Coast Guard Air Operations. There is a dress code of no flip/flops and no athletic attire, but shorts and pullover were okay. Again, $25 is a bit high. We could only stay for a week, of availability. Overall, a very good stay. This is a new park with very large sites and loved being able to tour Cape Cod easily from it. I gave amenities/facilities only a 3 because there are no facilities at the park. Laundry is at the Wings Inn where you check in. Only 2 washer/dryers, but they are free, so can't complain too loudly. We used the dumpsters in the nearby housing area because we couldn't find any other. We also were issued an oil drip pan which we had to put a $10 deposit on--rather strange. Staff is helpful and even led us to the campground the first time to make sure our utilities had been unlocked. Not picturesque, but nice to have a quiet, affordable place in such a popular tourist area. This is a brand new RV park and the nice folks who administer it from the Wings Inn are also new at RV park stuff, of course. I mention that because I have a few suggestions that should not be taken as criticisms. We loved the RV park. It is located on base, far from any noise or light. The spaces are gigantic pull throughs. They could easily be half the size and still be more than adequate. The area between each space is also unusually large. The base has a strange feel to it. It is the former Otis Air Force Base and currently Joint Base Cape Cod. It houses Coast Guard units, Air and Army National Guard, and has some sheriff's facilities. There is a well-stocked Coast Guard Exchange/mini-commissary, the first such I have ever seen anywhere. A decent movie theater which shows good movies for free, with a very inexpensive concession stand. The laundry facilities are inside the Wings Inn and consist of only two washers and two dryers. Wifi is available free, but only inside the Wings Inn. Lots of wildlife on the base. We saw tons of squirrels, rabbits, turkeys, and even a family of foxes. Now for the suggestions: The only trash dumpster we could find was located fairly far away. It should be a small matter to place a dumpster at the RV park. There is talk of expanding the park from the current five spaces to ten. They have room for at least 40 giant sized spaces and twice that number of normal sized spaces. I'm not suggesting 80 spaces, but 20 would seem reasonable and easily done. They have some crazy policy requiring all RVs to be issued oil drip pans. Yes, we were issued an oil drip pan for our travel trailer! 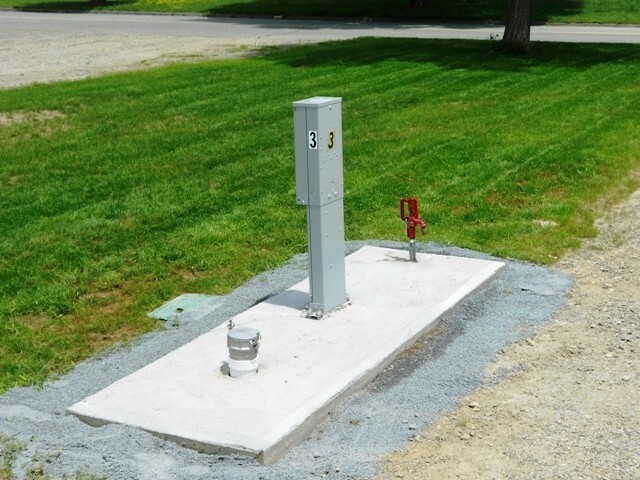 The sewer connections stand about six inches above ground, so gravity flow is an issue. This is also an easy fix. The Coast Guard policy apparently does not allow for late check in of RVs. The Wings Inn staff departs at 8 PM and after that an RVer is out of luck, even with a reservation. They should change the policy to allow after hours check in. With only five spaces it would be impossible to not find your assigned space. Again, we loved the park and the personnel at Wings Inn were friendly and earnest. We would stay here again if in the area. 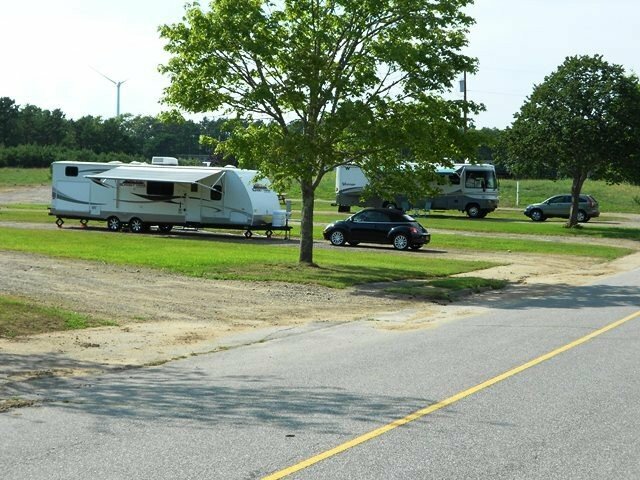 We return to Cape Cod every couple years to visit old friends and it is so nice to have an RV park where we lived so many years ago. The previous reviews covered everything thoroughly. Just want to repeat that the price is very good considering the location. On previous visits we stayed at the Bourne Scenic Park and paid around $40/night for water and electric only. A caution for small pet owners - we saw three very large coyotes one morning so don't be tempted to let your pets roam in the wide open fields. 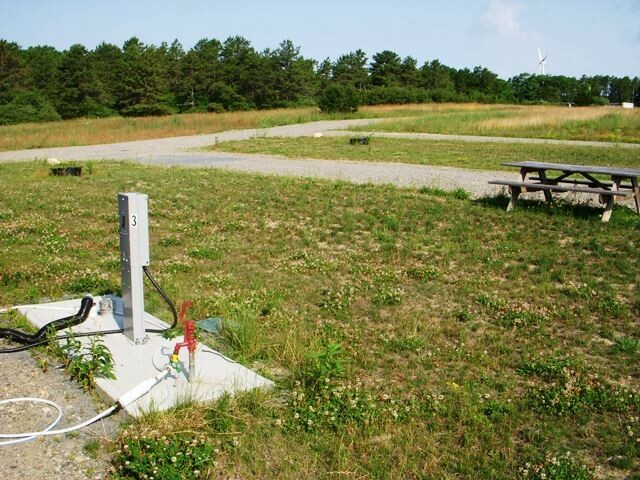 The RV Park at Air Station Cape Cod is located on the grounds of the former Otis Air Force Base closed in 1973. Until recently the base has lived under the name of the Massachusetts Military Reservation / Camp Edwards. That was changed in July of this year. It’s now called Joint Base Cape Cod. It is a huge piece of real estate totaling more than 23,000 acres or 13 square miles. There are four major tenants here and many smaller ones. Obviously there is a lot going on every day, but the character of the base is very quiet. It is so big much of the activity is not in sight or within earshot. If you are interested in learning more about the base and its mission check www.mmr.org. 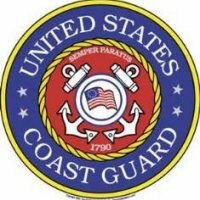 The RV park is operated by the Coast Guard, one of the major tenants, and it is is a small gem. At present there are only 5 parking spots, but the office tells me that they hope to add another 5 in the future. There are many good things to talk about. There is a small, but amazingly well stocked Exchange / Commissary. The base gas station is just adjacent (no diesel fuel), and both are within 1.5 miles of the RV park. There are no facilities at the RV park, but there are two free washers and dryers and a free ice machine in the same building with the RV / Coast Guard Quarters office where you will check in. The base is a paradise for walkers, runners, and cyclists. You will never run out of places to explore. There is a golf course which is a little rough, but where else on Cape Cod can you play 9 holes for $21, cart included? 18 holes are available if you desire. There is a base pool, and a cafe called the Crosswinds. The cafe has limited hours. Ask about their hours when you check in. You can eat at the Coast Guard chow hall located across the base in their air operations area. Ask the RV office for directions and a menu when you check in. There is a good MWR travel office that can help you set up things to do on Cape Cod. If you are the tourist type you will not run out of things to do while at the cape. One piece of advice though. Be prepared for heavy traffic any day during the summer, and stay in the park on weekends. It’s just plain nuts on Saturday and Sunday. That is the beauty of this park. It is a welcome respite from the world outside the gate. You won’t hear anything but the breezes. It is sooooo quiet ! The park itself is gravel. The spots are level if you position your rig correctly. All 5 spots are pull throughs and can easily handle the biggest rigs. 50 amp power and full services are available in all spots. There is no shade at all. The temps climbed into the high 80’s while we were there, but the lack of humidity and the near constant ocean breezes kept it pleasant. Wifi is available in the RV office area. Verizon Jetpack works well at the RV park. Pets are allowed with the usual restrictions and “pick up after” rules. There are a few things on the negative side. As noted earlier there are no facilities at the park. There is no onsite manager or host. It is a very small park and probably won’t grow much. The beaches are a 1/2 hour drive off base and parking on weekends is very limited. They do not allow RV washing at the park, and there is no car / rig wash on the base that I could find. In my opinion you will find no better RV facilities on Cape Cod without first mortgaging your house and your bird dog. It is a perfect base of operations for exploration. Call early though. The word is now out on this park and it will be tough to get reservations. Our visit was in August of 2013. This park is brand new (only one month old), and it looks it. It's basically a field with five gravel sites. The grass around the sites is kept well mowed, but the surrounding fields are overgrown. All hookups (30/50 amp, water, sewer) worked well. No shade trees (but we like that for good satellite reception). You register at the Wings Inn (guest quarters) office, and they direct you to the RV park about a mile away. (As of this date the park is too new to show up on Google Maps.) The published directions above have one error: the first turn to the right after entering the gate is W. Hospital Rd, not E. Hospital St. You then immediately take the left fork onto E. Hospital Rd. Office personnel are helpful and friendly, and they give you a personalized plastic binder with several pages of park/base information. Nice touch. (You turn it back in when you leave.) There is no bath house at the park. Free laundry and wi-fi is available at the Wings Inn, with two washers and two dryers and a nice lounge with soft couches and chairs. The park is very convenient to all the sightseeing locations of Cape Cod, and Boston is only 1 1/2 hours away. You occasionally hear coyotes howling at night. Bottom line: the park is not much to look at, but you can't beat the price and location.